La Tarte specializes in edibles for discriminating taste buds. 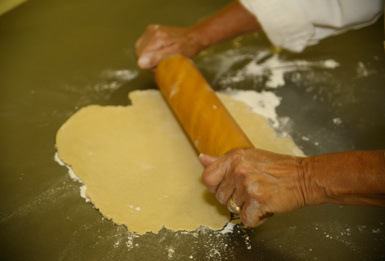 We pride ourselves on providing our customers with high quality homemade delectables. We adhere to the highest standards of excellence, using only the finest ingredients. In 1990, Merry Turner, founder of La Tarte, began supplying upscale groceries in the Milwaukee area with her signature Granny Apple pie. From there the wholesale business grew to include dessert bars and cookies. In 1995 La Tarte moved from its location in a Brookfield school kitchen to its present location in the Hyde Park neighborhood of Wauwatosa. With the move came the addition of a small storefront cafe serving our pastries, espresso drinks, soup, quiche, and croissant sandwiches. In addition we have an ever-changing display of unique gift items including pottery made by Merry's sister, Barb King, of Santa Fe, NM.